If you’re considering the Honda Accord as your next set of wheels for your trips throughout Cerritos, Downey, and Long Beach, you’ll want to be certain of which version is best suited for you. The 2019 Honda Accord LX vs. Sport are often the two trims that drivers are deciding between due to their similarities, but there are also some notable differences. At Norm Reeves Honda Superstore Cerritos, we’re here to help drivers get a sense of the LX vs. Sport Accord trims with what they offer and how they differ. This guide will help you determine which trim level is best suited for you! The Honda Accord LX and Sport each come equipped with a 1.5L 4-cylinder turbocharged engine that’s capable of producing 192 horsepower and 192 lb-ft of torque. 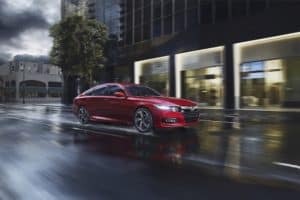 However, the Honda Accord Sport offers the available 2.0L turbocharged 4-cylinder, which pushes the performance further with 252 horsepower and 273 lb-ft of torque. The LX comes paired with a Continuously Variable Transmission (CVT) while the Sport includes a 6-speed manual, to give drivers a more hands-on performance. There are some pretty notable differences between the LX vs. Sport trims with their respective cabin features. The LX includes a 4-speaker sound system with a 7-inch customizable touchscreen. The Sport includes an 8-speaker sound system and the 8-inch customizable electrostatic touchscreen with high-resolution graphics. Each trim offers similar amenities like the radio, USB and auxiliary inputs, and the Bluetooth® connectivity. However, the Sport adds a few more options for drivers like Apple CarPlay™ and Android Auto™ for smartphone integration, HondaLink® for mobile access, and three months of SiriusXM® Radio that gives you access to more than 150 different stations of varying audio entertainment. 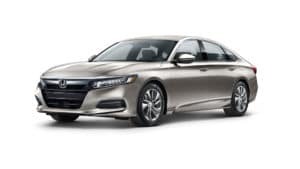 Another factor that carries over with the differences between the 2019 Honda Accord LX vs. Sport interior is the style. Since the LX is the base trim, it includes standard features like cloth seating, manual height adjustment, and the fold-down rear seatback with a center arm rest. The Accord Sport, on the other hand, updates some of the features. It includes the cloth seating, but adds the 60/40 split rear seats, as well as the 12-way power adjustment with a 4-way power adjustable lumbar support for the driver. The Sport trim also adds the leather-wrapped steering wheel and shift knob, as well as sport pedals to add to the trim’s theme. Did this Honda Accord LX vs. Sport comparison help you get a sense of how these trims differ? At Norm Reeves Honda Superstore Cerritos, you can get a closer look at these trims and how they differ. Of course, you can get a really strong sense of what they offer by climbing into the drivers’ seats and taking them out for a spin! Schedule your Honda Accord LX or Sport test drive with us at Norm Reeves Honda Superstore Cerritos! We’re committed to helping drivers in Cerritos, Downey, and Long Beach find the vehicle that’s perfect for them!